“Nixtamal” comes from the Nahuatl word nixtamalli which means “unformed corn dough.” Nixtamalization is the process of soaking the corn in an alkaline solution, such as “cal” or wood ash. This soaking process makes the corn more digestible and the nutrients in the corn more accessible to the body. On a practical level, it makes the corn easier to grind and makes it easily form into a dough (masa) for use in tortillas, tamales, pupusas, tlacoyos and more. To make posol (hominy), you skip the grinding process and simply boil the nixtamal corn in broth. Nixtamal has sustained our ancestors for thousands of years. 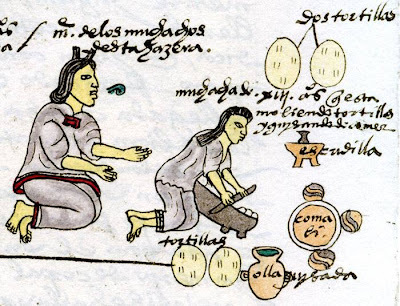 No one knows for sure when our ancestors first discovered the process of nixtamalization—the earliest evidence of nixtamal has been located in Guatemalan cooking equipment that is 3500 years old! I think it quite powerful—at a spiritual and cultural level—to reclaim this practice by doing it yourself. Converts corn’s bound niacin to free niacin, making it available for absorption into the body. Alkalinity improves the balance among essential amino acids, making more protein available. Is rich in calcium, iron, copper, and zinc. After nixtamalization with cal, the corn has 750% more calcium! Eliminates certain carcinogenic fungus found in corn. Note: Industrially-produced tortillas no longer use the ancient process of nixtamalization and instead use an enzymatic process that produces a much inferior masa. There are still tortillerias in the US and Mexico that produce nixtamal but I fear their days are numbered. Blame NAFTA. Because it is hard to find organic, GMO-free masa in the Bay Area, I decided I would learn how to make nixtamal corn masa myself. There are a lot of steps involved but it is not *that* difficult and totally do-able with a little practice and planning. And, nothing beats the taste of a tortilla made this way! It’s not spongy and sour like the fresher store-bought ones, nor dry and stiff like the older ones. The outside has a slightly toasted texture, the inside is tender but fully cooked. You can taste and smell the sweetness of the corn. Plus, you are eating something that is entirely good for you, you are resisting GMO tortillas, and you are connecting to an ancestral practice that is over 3500 years old. Buy organic dried dent corn. We bought organic yellow dent corn because we couldn’t find organic white dent corn. If the corn is labeled organic, you know that it is NOT GMO. Most conventional corn is now GMO. Here is our source for organic yellow corn: http://www.azurestandard.com/shop/product/1070// We are still looking for a source of reasonably priced organic white (and blue) corn. Please share if you know where we can buy some! This is the kind of tortilla press I have but I think I got it for much less money at a Mexican market: http://www.amazon.com/Tortilla-Manual-Tortilladora-Authentic-Kitchen/dp/B00AMO0HAC/ref=sr_1_7?s=home-garden&ie=UTF8&qid=1374127179&sr=1-7&keywords=tortilla+press I wish I had bought a wood one, like this: http://www.amazon.com/Tortilla-tortillas-pancakes-christmas-crispiest/product-reviews/B007MFF09M/ref=dp_top_cm_cr_acr_txt?ie=UTF8&showViewpoints=1 and you can also google to find how to use two plates for this task if you don’t have a tortillas press. Rinse 2 cups dried dent corn. Add 6 cups cool water to the non-reactive pot. Cook corn on medium heat for 45 minutes. Ideally, you want the water to just *barely* begin to come to a boil at exactly 45 minutes. This is not as hard as it sounds. The first couple of times you do it, you need to watch carefully. If it starts to look like it is about to boil before 45 minutes, turn the heat down a bit. If at 30 minutes, it is not even close, turn the heat up a bit. After 45 minutes, turn off the stove and cover the pot. Allow the corn to soak in the pot overnight and preferably for about 24 hours. Rinse the corn thoroughly under cool water. Fill a deep bowl or pot with cool water. Add the corn and using your hands, rub the corn vigorously between your palms. You are trying to remove the outer layer of skin (the hull)—it should fall off pretty easily. Do NOT attempt to clean each kernel one at a time. That would be insane. Just use your hands to massage the corn. It might seem like nothing is happening because the skin is pretty thin but you should begin to see little bits of skin floating in the water. Pour off the top of the water along with the little pieces of skin that have been removed. I repeat this step about 10 times, until the water I pour off is almost completely clean. Strain the corn one last time. Now, you are ready to grind the corn. Put a pan under the grinder to catch the masa. Put the strained corn in your grinder. I run my corn through the grinder a second time to get a softer dough. Form balls about the size of a golf ball (or a wee bit smaller). I have found that this recipe (2 cups of dried corn) produces about 1 dozen medium sized corn tortillas. Prepare your tortilla press and heat your comal (griddle). You want the comal hot when you put the first tortilla on. After the comal is hot you can turn the heat down from high to medium high. Line the tortilla press with two pieces of plastic. Thin plastic from a produce bag works best. Use scissors to deconstruct the bag into two equal pieces. Press the ball of dough between the two pieces of plastic. Push the lever down. Flip over and press again. Carefully peel the plastic off the top. Flip the tortilla so you are holding the tortilla on your left hand (if you are right handed) and the remaining plastic is facing up. Remove the plastic. After the edges of the tortilla start to turn up slightly, flip the tortilla. Continue cooking for a few minutes. You can flip the tortillas a few times until they look done. Put the finished tortillas between a folded clean dish towel. Don’t worry too much if you think the tortilla is still slightly raw in the inside. Make more tortillas and let them rest together in the clean towel. They will continue cooking on the inside. By the time you serve them they will be perfect. ENJOY!